Unlike most people I was (and am) a big fan of User Account Control (UAC) in Windows 7 (and even Vista). I have often referred to it as the ‘Are you really sure you want to do something stupid?’ button; it let you know that you were about to do something that would affect your PC, and to proceed with caution. In Windows 7 Microsoft improved the UAC experience by allowing us to control it beyond the simple O/I settings. Combine that with the fact that ISVs stopped programming their applications around security holes in Windows, and the UAC experience in Windows 7 was a much less annoying one than it had been in its first iteration. Windows 8 introduces a new concept that is similar in nature, called SmartScreen. It monitors your system for software installations. If you try to install an unrecognized application it pops up a warning message. It is another way Windows helps to keep your computer secure. Don’t misunderstand… this is not Big Brother. If you really want to install the application then it will still let you. 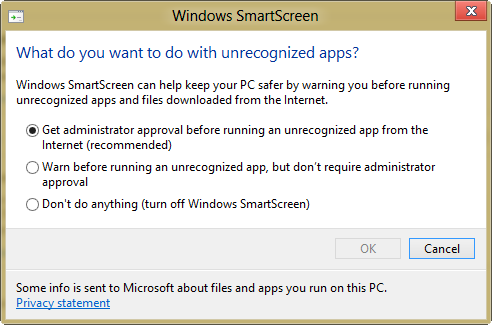 SmartScreen is just another way Windows has to let you know that you should be careful. Of course there are people who would say ‘Let me do my thing, and stop pestering me!’ For those people you can simply turn off SmartScreen. For the rest of us, there are two settings for ‘On’. The first, which those of us who administer systems for others will appreciate, is the ‘Get Admin approval’ setting. That way your users will not be able to install applications from shady developers. The second ‘On’ setting is ‘Warn but proceed’. In other words it will let the user know that there may be rough roads ahead, but doesn’t prevent you from taking them. Those of us who administer systems for others will likely prefer this setting for our own computers. 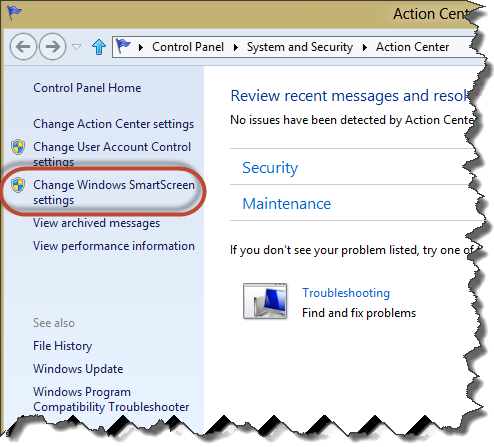 SmartScreen is even configured from the same screen as User Account Control… or at least you access the settings from the same Action Center screen. 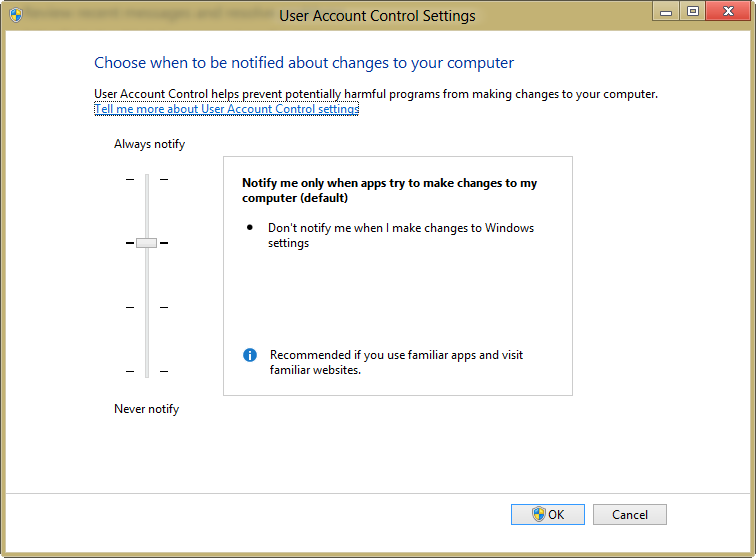 Notice that next to both ‘Change User Account Control settings’ and ‘Change Windows SmartScreen settings’ both have the little ‘shield’ icon next to them. That indicates that they are both protected by UAC, and that if you are not an administrator you will not be able to make changes to them. This is one more reason why you should not disable UAC… especially if you administer systems for others – even your family. Protecting your systems is easy, but it is a slippery slope to unsafe, and that slope is easy to avoid… but turning off UAC is akin to walking up to a cliff and tearing down the fence that prevents people from falling over. We have come a long day from the days when running Windows required third-party add-ons to keep us safe. Today we only need to use a little common sense… or better yet, leave things the way they are, because most of these security features in Windows 8 are enabled out of the box, and you would have to actively reconfigure it to subject yourself to the malwares and Trojans of the IT world.